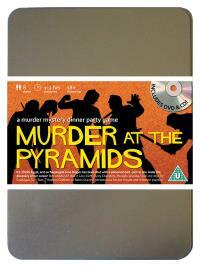 You've been invited to play the role of SHIM-ME ATJA in Murder at the Pyramids. Egypt, 1924, and archaeologist June Digger has made the most incredible discovery of the century. Friends and luminaries have gathered to witness her findings but before anyone can say “Tutankhamun”, June is found dead, killed with a poison dart shot from a blowpipe. This was no curse, this was murder! Host your own party to find out who snuffed June’s candle! Belly Dancer (she sheiks it for money!) Costume Suggestions : As a bellydancer, your dress code is designed to show off your best feature: a perfectly flatstomach. You wear bright sheer fabrics and every inch of exposed flesh is covered with gems and gold chains that make music as you move. You never wear shoes so you can show off your painted toenails. I work as a bellydancer at the local Naval Club and my husband runs a camel riding school in the next town. I believe it is foolish to mess with ancient forces that cannot be understood and I think that June Digger would still be alive if she had not been rummaging around in Queen Priti-Titi’s sacred areas! Hopefully now the tomb will be closed forever.